We talk about off-page SEO a lot. Building and managing the backlinks is a vital aspect of SEO, and it keeps getting complicated. However, on-page SEO is a hot topic too; mostly now that Google is progressively shifting to semantic search, and the old-style plans don’t seem to work as well as they used to. If you don’t get the technical groundwork right, your other SEO efforts might bring no results at all. SEO auditing is an important facet of a website when it comes to digital marketing. It’s an absolutely essential process that will empower your business with real, actionable insights. When done correctly, an SEO audit will tell you what’s working on your current website, what’s falling short and how you can improve your site to rank higher and generate more leads. Why it is important to perform an audit of the website on a regular basis? Things change very quickly in the SEO industry and what is working today may not work in a few months from now. Google reportedly makes changes to their ranking algorithm every year and thus an SEO audit will help you stay informed about the changes that need two be performed on the website. It is necessary to perform regular SEO audits (at least twice per year) to make sure that your website is up-to-date with the latest developments. Google rewards websites that it has confidence in. Each visit to your site by search engine crawlers like Googlebot presents an opportunity to build this confidence. If your website forces Googlebot to waste resources and fill in gaps of uncertainty, Google loses confidence in your domain, and your rankings, search traffic and profits will drop like a stone. Lots of agencies and consultants provide SEO audits, and they are expensive. An audit that actually provides any useful information is time-consuming and requires expertise. It can sometimes seem like a black box, and it can be very scary for someone who is unfamiliar with it. Before getting into the details on how to perform an SEO audit, it is important to understand the meaning of it and what to expect as an end result. An SEO audit consists of a methodical examination of your website, that results in a recognition of its on-going issues that need fixing and different opportunities you can capitalize on. While there is a number of tools you can use for an SEO audit of a website, one of the best approach is to either perform the audit by following a guide or hire an SEO Auditor to carry out the work for you. The SEO auditor will manually go through the website and come up with recommendations, suggestions of what needs to be fixed and what needs to be changed to improve the ranking of the website organically in the SERP. How to perform your own SEO Audit? Now you are convinced that an SEO audit is necessary for every website, let’s see how you can perform your own audit. We wanted to cover, in the most effective way possible, all the elements that are important for making your website accessible, efficient, visible in SERP, functional and easy to understand. The recommendations in this document should be fixed in the order they are listed, first by section and then by color with red being the most immediate fix. Before turning your focus to ranking high in search engines, it’s important to make sure your website is set-up to convert the traffic the website receives. This ensures you get the most out of your SEO efforts. These are the additional techniques your website can implement to increase conversion. Call To Action It is an essential element to help convert prospective customers into sales – especially when it comes to websites and optimizing them for conversions. Social Proof Social proof can greatly increase a website’s conversion rate. It is an attempt to build credibility and trust towards your business by showcasing what others think of it. It is a tactic used by businesses worldwide to increase conversions by putting the customer at ease, knowing other people have used the same services or bought the same products. Navigation Website Navigation is a set of user interface elements. The main purpose of navigation is to help visitors to find the required information and functionality, and to provoke them to take certain actions. Favicon Favicons are like your site’s little ID. They help users remember your site while browsing through multiple URLs. So, whether it is browsing history, search results in DuckDuckGo or list of bookmarked sites in your browser, favicon help the users to easily recognize your website and access it. This is because graphics are far better perceived than text. Logo A logo is a representation of who you are as a business. Phone Number Some people might argue that phones are used more these days for playing music, gaming and messaging than making voice calls, but for business owners, this is different. Almost all businesses need a phone number to be contactable by current and ongoing customers. People are automatically suspicious when they can’t find a contact phone number. Many potential customers prefer to dial a number rather than fill out a form or send an email. 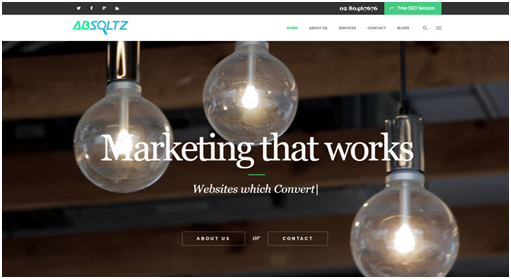 With your website better set-up to convert visitors, attention needs to turn to better optimizing the websites you’d like to target. This means each page needs to be set-up for search engines to crawl and index correctly to achieve top rankings. Keywords SEO is optimizing your web pages for better ranking in search results pages (SERPs). Part of the SEO process is using keywords: words and phrases that explain what your content is all about. We use Keyword Density Analyzer which is aa online free tool by SEO book to check percentage density in your content and find how many number of times a keyword is used on a webpage. One of the important starting points when using keywords for SEO is doing the right keyword research. This is how you find the right keywords to include on a web page in the first place. Moreover keyword research also helps you come up with your content strategy by making content around the word or phrase that you know your audience is looking for. Duplicate Meta Titles A title tag is an HTML element that specifies the title of a web page. These Meta titles are displayed on search engine results pages (SERPs) as the clickable headline for a given result, and are important for usability, SEO, and social sharing. The title tag of a web page should be precise and brief description of a page’s content. Generally Google only displays the first 50–60 characters of a title tag. If your titles are under 60 characters, then you can expect about 90% of your titles to display properly. There is no exact character limit, because characters can vary in width and Google’s display titles max out (currently) at 600 pixels. You can check for duplicate meta titles and descriptions using Screaming Frog tool. Empty Description Meta descriptions give you the concise summary of webpages. They are somewhere between one sentence to a short paragraph and become visible underneath the blue clickable links in a search engine results page (SERP). But depending on a user’s enquiry, Google might pull meta description text from other areas on your page (in an attempt to better answer the searcher’s query). We tend to keep descriptions in between 150-160 characters because Google usually truncate snippets that are longer than160 characters. URL Structure A URL is a human-readable text that was designed to replace the numbers (IP addresses) that computers use to communicate with servers. Keeping URLs as simple, relevant, compelling, and accurate as possible is the key for getting both your users and search engines to understand them (a prerequisite to ranking well). Even though URLs can include ID numbers and codes, the best practice is to use words that people can understand. Text Formatting Header tags are an important on-page SEO factor because they’re used to communicate to the search engines what your website is about. Search engines distinguish the copy in your header tags as more important than the rest. This starts with your h1 and works its way down in significance to the h2, h3 and so on. Use of Internal Link Structure Internal links are links that point from one page on a domain to a different page on the same domain. Internal link building should follow a pyramid structure. With this pyramid structure, your home page rests at the top. Directly underneath lay keystone pages or category pages that link profoundly to appropriate blog posts or product pages. All pages directly within one link of the home page will be perceived as the most important to search engines. Optimized Images Identifying images that are heavy on file size and causing increases in page load time is a critical optimization factor to get right. This is not a be-all, end-all optimization factor, but it can deliver quite a decrease in site speed if handled correctly. Broken Link When visitors follow links to or from your site they are expecting certain content to be available to them once they get to that page. Broken links are bad for user experience and are also harmful to your site’s loving relationship with Google, i.e. your SEO. Avoid linking to broken content, and also avoid having pages on your site that are broken. Check for broken links on your website by using Online Broken Link Checker. 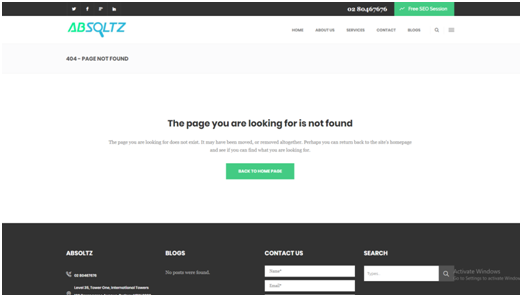 Custom 404 Page When a page you are trying to open on a website cannot be found on their web server, it gives you a 404 error page. A 404 error is a response code from the server that comes under HTTP status codes. Page speed can be described as either “page load time” (the time it takes to fully display the content on a specific page) or “Time to First Byte” (the time taken by the browser to receive the first byte of information from the web server). It is important to use the tools search engines provide you so they can notify you of any errors they find when crawling your website and so you can monitor what’s happening with your website in search engines. Google Analytics Google Analytics is a free website analytics service offered by Google that gives you insights into how users find and use your website. With the help of Google Analytics, you can track ROI for your online marketing. Google Analytics is a free web analytics tool offered by Google which helps in analyzing the website traffic. XML Sitemaps Search engines use crawlers to organize and index information on the web. These crawlers can read all kinds of information. But an XML sitemap makes it easy for the crawler to see what is there on your website and index it. Once it does this, your website has a strong chance of improving its rank quickly. Basically, an XML sitemap works as a table of contents for your website, allowing the crawler to get the essentials and index your site accordingly. .txt Robots.txt is a text file which webmasters create to instruct web robots (typically search engine robots) how to crawl pages on their website. 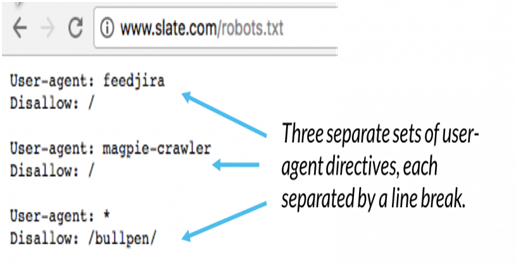 The robots.txt file is part of the robots exclusion protocol (REP), a group of web standards that regulate how robots crawl the web, access and index content, and serve that content up to users. The REP also consists of directives like meta robots, as well as page-, subdirectory-, or site-wide instructions for how search engines should treat links (such as “follow” or “nofollow”). With your website properly optimized, you’re ready to start marketing your website elsewhere on the internet. # of Incoming Links The benefits of inbound links to your website are paramount. Quality of the inbound links is more important than the amount of it. These Quality links may have a positive effect on both your rankings in Google as well as your PageRank. The only catch is getting good links, and for that, you just have to create good content that can inspire people to link to it. Authority DA is a ranking metric developed by Moz that predicts how well a site will rank. It is one of the industry standards we use when we talk about SEO and ranking on the SERPs. It is measured in the range of 1 to 100. The closer you are to 100, the more traffic and better ranking you will have. Thinking about your DA must be a part of your overall SEO strategy. 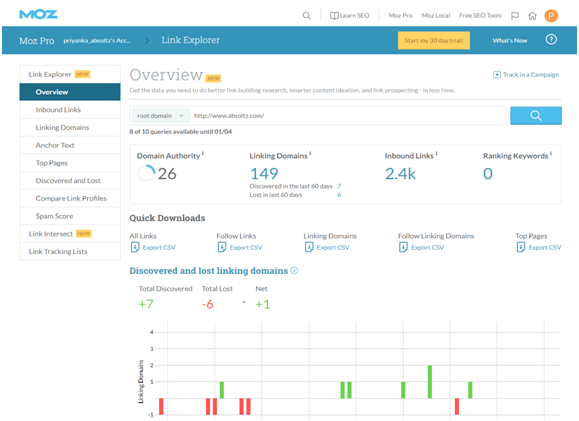 The tool which we use for checking domain authority is Moz bar extension. After following these subsequent steps, you should have discovered lots of changes you can make to your site to perk up your rankings. A full forensic SEO audit is a much lengthier procedure (taking anything from a few hours to a few days, depending on the size of the site). However, this process is a great way to launch any new SEO campaign and get an experience on how a site is currently set up. You may also want to return to Site Explorer to more thoroughly examine the site’s link profile, and look for additional keyword opportunities in Google Keyword Planner. If you have any queries or have any tips about the audit process you would like to share, then please leave a comment below.